This is one of the shows i’ve really been looking forward to arriving on UK shores. 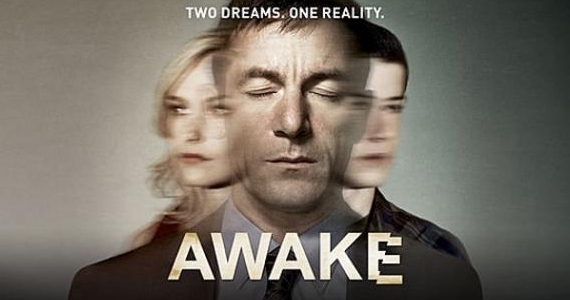 New US drama ‘Awake‘ stars Jason Isaacs (Harry Potter, Case Histories) as a detective who finds he is leading a complex double life that defies reality… Following the story of Detective Michael Britten (Jason Isaacs) who survives a serious car accident only to find he is living in two parallel worlds; in one world, his wife, Hannah (Laura Allen, Terriers), survives the crash but his son dies and in the other world his son, Rex (Dylan Minnette, Saving Grace) is alive and grieving over the death of his mother. Michael navigates between these two worlds, each populated with its own psychiatrist, police partner and of course, murder cases. Michael quickly discovers that his dual existence is actually a powerful tool and he begins to solve impossible cases by using his two realities to gain unique perspectives and link clues that cross over from world to world. Helping Michael to navigate his two realities are his LAPD-assigned therapists Dr. Evans (Emmy® Award winner Cherry Jones, 24) and Dr. Lee (BD Wong, Law & Order: Special Victims Unit). He is also partnered with either Detective Isaiah “Bird” Freeman (Steve Harris, The Practice) or Detective Efrem Vega (Wilmer Valderrama, That ’70s Show), who both begin to wonder how Michael is able to connect seemingly unrelated clues. While Michael is understandably reluctant to confront which of the realities is true, hidden memories from the crash begin to surface, forcing him to confront the truth about what really happened. Awake is scheduled to air on Sky Atlantic HD on Friday 4th May at 10pm. Keep an eye on our UK Air Dates page for all the latest tv premiere dates. ← Sky Movies HD to show entire James Bond Library! “Sky Atlantic Says Hello To Jason Isaacs” – I see what you did there. Hello indeed. I love this show… I think it’s brilliant! Really original and clever. I hope it doesn’t get cancelled!!!! And can’t wait to watch it properly on Sky! This is why I only invest in cable shows. Have liked the look of this for a while, shame it’s on the verge of cancellation in the US. Just need someone to pick of Person of Interest now!